People enjoy completing their own paint jobs on their vehicles for a number of reasons. Whatever your reasoning, it’s important that the job is done properly. 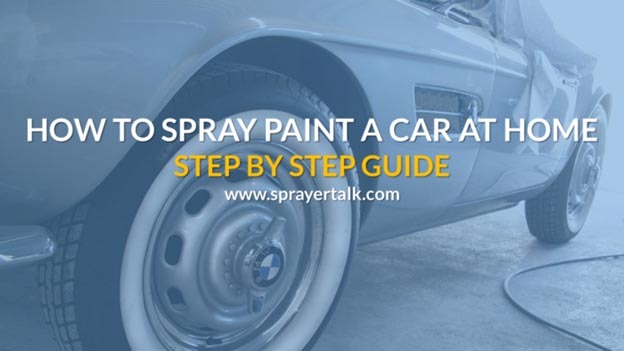 This guide will teach you how to spray paint a car the correct way! You will learn and understand how to paint a car at home. 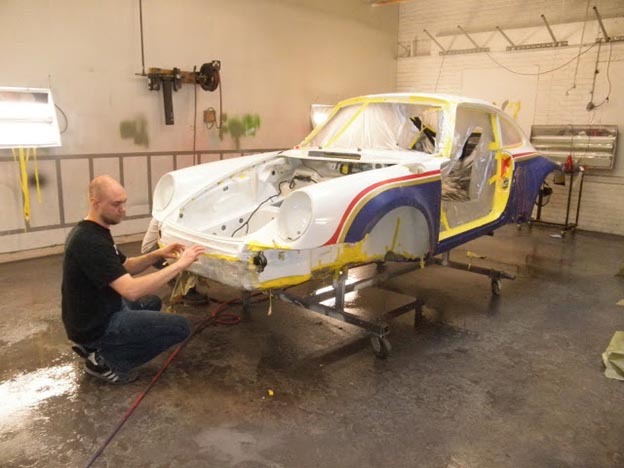 I will discuss with you all the difficulties that come with getting spray paint off a car, preparing an automobile for spray paint and finishing the job like a pro. The number one reason people paint their car is to achieve a better look. Getting the car painted by a professional will not only cost you a lot, but it is not easy to always find a qualified painter in your area. It can also bring you a good deal of pride to restore your own vehicle and enjoy the finished work. If you are a beginner then you will realize it’s neither an easy job nor a difficult one. This may seem overwhelming but if follow this guide you will find the help you need to get started. You’ll also learn how to make your tasks easier. Painting your own car at your home and by yourself starts with knowing how to spray paint using a spray gun. With the assistance of a good paint sprayer and a few other materials, you can paint your car at your home relatively easily. A spray gun reduces time, effort and creates a quality finish ensuring that the color will be applied to the car with the same thickness. It will take some time to paint a car yourself. The whole process is lengthy but when you see the results you will be pleasantly surprised. Be sure you’ve set aside a few days for painting or, at least, two or three weekends. Can you spray paint a car? We’ve shown you the answer is yes, but there are many steps involved with the painting of your vehicle. Follow the instructions perfectly if you want to achieve the best results for the lowest cost. The better you prepare, the better the results will be. You are going to need a location that will be available for up to several days at a time. Painting a car takes time, so don’t plan on moving the vehicle during the process. Try to pick a place in the shade. You’ll also want to stay away from any elements that could end up on the car. 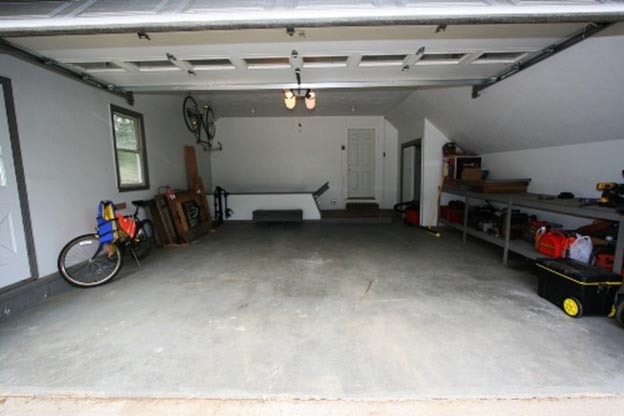 The best location to consider might be the garage, just be sure you have proper ventilation. Once you have all the materials ready, you can learn how to paint a car with spray paint. Another aspect that needs to be addressed before the painting process begins is how much paint you need. You are going to need more paint than a professional would. This is because you aren’t as experienced and are bound to waste some material. As you practice and learn new skills, the amount of paint you need should decrease slightly. For medium or smaller sized cars, you will need 1-gallon of base coat, 3-gallons of top coat and approximately 2 to 3-gallons of clear coat. For a larger sized car, you will need 5-gallons of base coat, 4-gallons of top coat and 3 – 4 gallons of clear coat. Always be sure you have more than enough paint to complete the job. It is always best to have some extra than not enough. Be sure you’ve chosen the best spray paint for cars to ensure a quality job. To match the original color you’ll need to find the color code of your vehicle. Most cars will have this information listed in the driver’s side door jam. If you can’t find it there, you can also look near the VIN number on the windshield. For example, if you have a black vehicle, you’ll need to match it with a high-quality black spray paint for cars. It will do you no good painting your own car if you don’t have the best paint sprayer. To find the best car paint spray gun on the market, you will only need to look to our comprehensive paint sprayer reviews to find all the answers. Read through our reviews to make the best choice for you. Be sure you compare the top paint sprayers for cars and keep an eye on your budget. 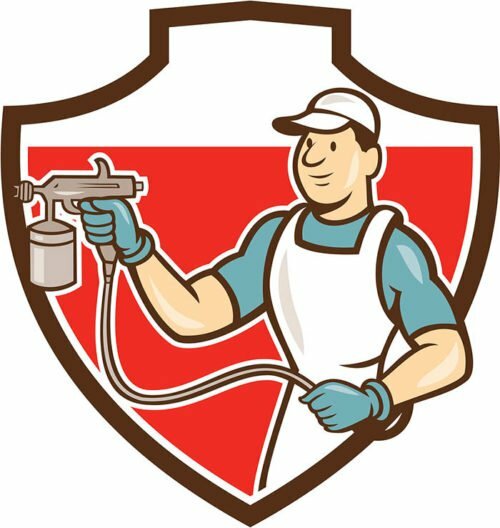 Because we have extensive knowledge in the paint sprayer industry, it is highly recommended that you take our suggestions for the best paint sprayers. For painting your car, we recommend the Devilbiss Finishline 4. This has been the best sprayer on the market and can be used by an amateur to create professional quality work. The next step is to prepare the area you’ve chosen to work in. You will want to be sure there is no dust. If you are working outside, be sure to move anything that could blow onto the car during the painting process. Never paint under a tree as there is a chance leaves and debris can fall on the vehicle and ruin your entire job. Make sure you wash the car thoroughly as you don’t want there to be any dust, road dirt or grease left on the car. You’ll then need to decide which parts of the car you are going to paint. You can strip down the car to make it easier or mask the area which doesn’t need paint. In this section, I will show you how to get spray paint off a car before you begin. Make sure you put your dust mask on before completing this task. You’ll also want to consider wearing eye wear for additional protection. If you have a dust extractor, be sure you have it cleaned properly and it is turned on. Now you are ready to learn how to remove spray paint from the car. You must remove the spray paint from the car before you put any more paint on. Using a large-grain sandpaper, possible 600-grit or similar, rub the entire surface of the car. Use circular motions while sanding. Be careful to pay close attention to the crevice areas on the vehicle. This is hard work and you may face some temptation to quit here. If you are patient and give the process some time, you will start to see the paint coming off. Once the paint has been mostly removed, switch to a finer sandpaper comparable to 1500-grit. This will help to remove scratches and corrosion. If you find holes during this process, be sure to use some putty and repair the damage before going any further. You will want to ensure that your sanding job left a smooth finish to the car. In addition, the surface should be even. This will help the paint to apply properly. You can use a quality wet sandpaper and a dry sandpaper to achieve the best results. Take a rag and wipe the entire surface down gently. You should use the thinners to remove any remaining dust. Give it time to dry and evaporate completely before moving forward. Cover all areas of the car which you don’t want to get painted. Use newspapers, plastic sheets and tape to mark off these areas. Mix your primer and thinner together as directed on the paint can. 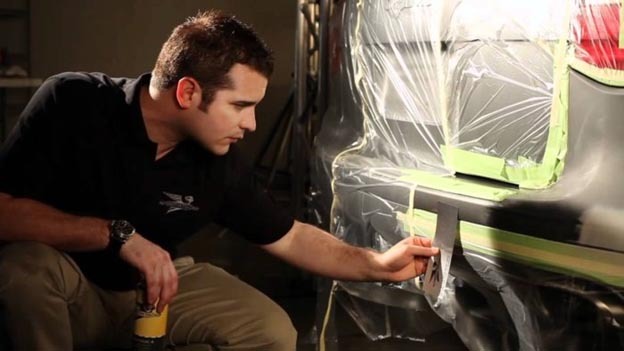 Practice by using your spray gun on a board or sheet before you spray paint your car. This will help you get accustomed to the sprayer and help to stabilize your hand. Maintain a 6-inch gap between the board and spray gun at all times. Use the sprayer in a vertical position and spend ample amount of time practicing. Once you feel comfortable starting the car, you can begin on the car panels. Be sure you coat everything evenly and apply two coats for optimal results. In between coats, you will want to ensure that there has been plenty of time allowed for complete drying, normally between 10 – 12 minutes. Hold a 6-inch distance between the car and the spray gun at all times. Never spray from bottom to top or top to bottom. Only press the trigger of the gun when you are moving from one side to the other. Don’t hold the trigger continuously. It will create an uneven coating. It is finally time to learn the art of painting a car with spray paint. By now you should be a pro at using the paint sprayer, but you should still practice before applying spray paint on the car. Each panel should take about 10 minutes when you are spray painting a car. You’ll always want to allow the paint to dry completely before applying another coat. If you don’t wait, the paint may not adhere to the car properly. Different materials can come out of the spray gun differently, so practicing for a few minutes will help to ensure an even coat. Inspect your paint job carefully and look for any flaws or imperfections in your work. If you find something wrong, use your sandpaper to smooth it out and then repaint the area. Fixing an error now will save you time and money later. You will want to apply two coats of paint, but before you apply the last coat, you’ll want to use the wet sandpaper and dry sandpaper of 200-grit to remove any powdery residue from the vehicle. Then, wipe the car down with a clean rag. Now you are ready for your final coating of paint. Be sure you spray gun is cleaned properly before use. Properly mix the car spray paint with thinner as directed by the paint can. Spray your first coat of top coat paint moving in a side to side motion. Be sure the paint is dried completely before the second coat is applied. Once you’ve completed the painting, be sure you remove all the tape from the car. Removing this prior to the clear coat drying is essential. Be sure that the clear coat has dried completely before doing anything else with the car. Here are some images of before and after paint jobs on cars. This job is completely possible with the proper tools and a little patience. You can have complete control over the outcome of your car and even save a little money in the process. Your vehicle will be the envy of all the neighbors once you’ve finished updating the paint job. I’ve been a huge fan of spray paint. I tried it on my car and it’s very cool. It’s completely new and different. If I’m being honest, I had no idea that so much went into painting a car. I really liked your approach to walking through the whole process though. It really helped me understand what I was looking at a lot more, and made me think that I may be in a little over my head. It may be fun to try eventually, but for now I think I’ll favor taking it to the pros for work. Thanks for sharing! Thanks. I am very glad that you like it. Are you kidding me? Are you painting a Boeing 747 or a locomotive or something? A medium sized car should take a gallon (at most, unless doing a color change) of basecoat (I guess you mean primer), and then maybe a half gallon to a gallon of topcoat and maybe a gallon of clear coat at most. Where did you get these quantities?